Here is out first "Best Thing". It is a Hawaiian Shirt by "Paradise Found"
The thrift store that we found this shirt has a "Fill A Bag for $5.00" every Wednesday and Friday. You can easily fill a grocery bag with at least 20 pieces of clothing. When you are just starting out trying to figure out what to sell on Ebay, you have to take a few risks. Paying a quarter for an item of clothing is definitely a small risk. I definitely like the red one better. The red shirt was listed at auction for $9.99 with no bids, and it too went in to the store for $19.99. It did sell, but the buyer was non- paying so it will be going back into the store. This particular brand of Hawaiian shirt was worn by Tom Selleck in Magnum P.I. Some of you may remember that T.V. show. 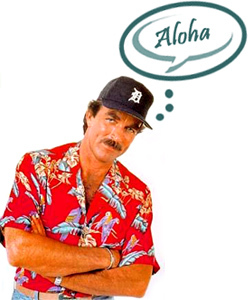 In the 1930's and 1940's the "Aloha Shirt" became a universal symbol of Hawaii's warmth and spirit. Today, almost 70 years later, Paradise Found & Diamond Head Sportswear carry on the Hawaiian tradition by manufacturing the highest quality, most authentic versions of the islands favorite designs. From the warm, romantic days of old Hawaii, we proudly present our collection of "Made in Hawaii." The islands most authentic designs of nostalgic and modern "Aloha Shirts," all of which embody the spirit of Aloha! Time to hit the thrift stores again and look for more of these little beauties. Hope your thrifting adventures bring you much success! Ha. That's really cool. That definitely makes me want to start posting things on eBay... Hope you continue to share these thrift-store/ebay adventures! Great shirts & prices!! Anything that Tom Selleck may have worn is A-ok in my books!! lol! Loved that show!! You know, I could really get into that! I LOVE thrift store shopping and I think I could spot items that I could resell. Perhaps that would be a good hobby for me when I retire! A 25c shirt for 19.99 - WOW! I sure enjoyed Magnum P.I too! Odd, my comment got eaten by the internets. I tried to say I really enjoyed this post! I hope you share with us some more of your ebay/thrift store adventures. And, is it bad if the only reason I know Tom Selleck is because of his mention in the animated movie Meet the Robinsons? Ha. Wow, I never would have guessed that would be a #1 item! Haha shows what I know.